I recently read this great post “Is Your Social Media in the Red or the Black?” by Lissa Duty. The entire post offers some great points about what you’re doing with your social media activities, but one point we felt needs some further explanation is the first part of #5. Lissa asks, “Have you claimed your business listing on Yahoo Local, Google Places, Bing Local, etc. ?” This question seems like a very basic one. It makes complete sense that a business would make it as easy as possible to find its location through the various services available. However, I think a lot of these get overlooked fairly often, or people who aren’t immersed in social networking aren’t aware they exist. The big ones generally get hit, like Google maps or Foursquare, but these aren’t the only services used to locate businesses and you could be losing prospects to competitors who are listed there. It’s easy, it’s free and it doesn’t take much time. If you get just one customer from making sure that you’ve covered all of your geo-location bases, then it’s time well spent. It’s also important that you include as much information as allowed. You might as well help your potential consumers understand your business in the easiest possible way. You want a listing on Google Local if you have any kind of actual address where people might visit you. You get analytics each month and you can see the keywords people are using to find your listing, which is really helpful. Similar in purpose and features to Google, Yahoo is used daily by people for stories, news and more and so you also want to be found here. Aside from merely being found via a search, you can be found on Bing in a related business or geographic area search, which might introduce you to people as more of a “happy accident” than if they do a deliberate search. If you have enough foot traffic you can claim your business and get analytics, offer specials and take advantage of Foursquare in other innovative ways, so for a retail, hotel or restaurant establishment, this site is a MUST. Foursquare is gaining in use and popularity. People routinely use their Foursquare applications to find a place to eat, get gas or buy something from their mobile smartphones, so you want to be listed correctly and found easily here. Gowalla is a Foursquare competitor and if you have regular foot traffic it would benefit you to be found and listed here also. 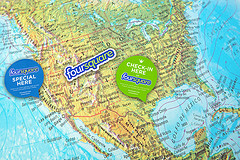 You should encourage folks to check-in to their Foursquare or Gowalla accounts from your place – it’s free publicity! Yelp is the go-to source for reviews, but it’s not the only review site. However, it’s been around a long time and a lot of people visit it routinely to find a place to eat, locate a good hair stylist, and obtain recommendations on everything from churches to swimming pool installers. If you haven’t already, you should also set up a company profile on Linked In, and once set up, it will automatically pull in data about your company from around the site. The link here is to a Mashable tutorial and explanation article that’s especially good. As usual, if you have any questions let us know!